Oh, Japan! Land of Picachu, Yu-Gi-Oh, and weird, weird things. As an exception this time, news about Japan is actually not weird. Not that weird at least. 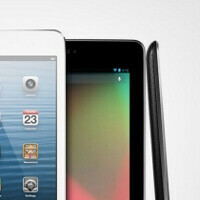 Right to it, the Nexus 7 has overtaken the iPad mini as the best selling tablet in Japan over the Holiday season. They are close, but the Nexus 7 beats it with a few percentage points. Market research firm BCN actually surveyed 2,400 retail stores in the Land of the Rising Sun and found the Nexus 7 share was 44.4% of all tablet sales, while the iPad mini accounted for 40.1%. The difference is 4.3 percentage points, and the two obviously leave almost no space for other tablets. The reason for this is obviously price. The Nexus 7 costs 19,800 yen ($221) while the iPad mini starts at the much higher 28,888 yen ($322). One thing to take into account, though - Japan is a very tiny market. Overall, sales of tablets in the whole of 2012 stood at merely 3.6 million tablets. The reason is price AND quality. The Nexus 7 is a current product with a fast processor and great screen. The iPad mini is pretty when turned off, but when you power it on you get a 2 year old iPad 2 specced product that will be obsolete in 2 months. Finally! Some people are coming back to their senses! Oh, but wait...it's Japan, people here know what's inside of them devices. It won't be long before people all around the world that there's more fruit other than 'Apple'. And PA, i think Picachu is spelled with a "k" resulting in Pi'k'achu...if i'm not wrong. Japan the, "Land of rising sun" no one can have better understanding of excellent technologies than them. They are one heck of technologist. Even as an Android user I disagree with this, and it's why I left my Galaxy Tab10.1 and got a iPad4. When it comes to tablets Android simply isn't ready, not to against the iPad. The Nexus7 looks alright on paper but is anything but in reality, the Content e.g. apps, games, eBooks, magazines, newspapers etc...are optimized for N7 and other Android tablets are few and far between especially when looking at each country specifically, it's quite shocking. The iPad Mini may not be the best specced tablet, but it truly delivers when it comes to high quality content. Why the patronising opening? Do you own a Nexus 7? I guess not. The comparison is between Nex 7 vs ipad Mini and not ipad4. Get it? Did you read my post correctly??? I'm talking about Android tablets in general and iOS in general, nothing I said applies specifically to one device in either platforms so whether I spoke about iPad4 or Mini it doesn't matter, guess you're just choosing not to see my point, and to end my point I did mention the Mini. Apsa do not need to be optimized for the Nexus 7, since unlike iOS, Android dynamically resizes content to the resolution of the screen, like a PC. So, while they can be made to look better, its not nearly as important that they be redone for the tablet add it is for iOS, where its critical. Does it really matter that iOS have more optimized apps than Android? I have a 7-inch Galaxy Tab and for me is enough for reading e-books, web browsing, watching videos and playing games. I downloaded some magazine and newspaper apps and I didn't like them, I prefer to read them with the web browser because it is easier to save for read later or share with some friends. And it cost me half the price of a iPad, or comparing to the iPad mini, almost 70% of the price. So, the price is an important issue. Their job is to report to us the news , not having a Andriod praising article . Can't you think of it as they are just reporting the facts ? My Nexus 7 is made from plastic and I also have some problems with the display,but at 200$ we cannot receive premium build quality like iPad mini has.I don't have nothing with Google's Android but I cannot find optimized apps for tablets in Google Play in comparasion with Apple which has the App Store with thousands of apps for tablets.And if you check some comparasions between them on youtube you'll can see that Nexus 7 is faster on loading pages,but the iPad Mini is smoother,so a two years old processor A5 is better that a new one Tegra 3. More proof the Japanese are smarter then the average American. No doubt. They probably also paid cash for their tablets and didn't put them on Credit Cards. Americans aren't a financially intelligent people they think borrowing money, having nice things today and paying for it later is a sustainable lifestyle, and still expect they'll have money for retirement. is N7 widely sold through big US stotes like Best Buy, Walmart...? Well , Google isn't a bad brand , who doesn't know what is Google ? Nobody ! Did anyone else read the article besides me? It only outsold the iPad by 4.3% which means a lot of people still bought the Mini. Which isn't to say the Mini is a good tablet, just to say you all are making it sound like N7 doubled the sales of the mini. These percentages are not huge even though google has the 4.3% apple still wins because they make more money on their tablet. Either way both parties are doing great. What d u get out of it...? I'm sure this is going to change in the iPads favor further in the year, once people begin to run into the Nexus7 issues, and discover that not a lot of content is optimized for Android tablets. For now congrats to Google, if there is one thing that Google have got right with the tablets it is pricing, this is setting for a great battle, and Apple will have no choice but to lower down their prices :) and so this is great for the entire industry. As someone who owns both a Galaxy Tab10.1 and iPad4 though, I must say, Google need to get their act together when it comes to developers, we need more tablet friendly apps in Android and better quality ones to, for example has anyone here used Bloomberg for iPad and Bloomberg for Tablet in Android??? It's like day and night, as an Android fan I feel like we are just an after thought when it comes to tablet apps and games, on the other side as a iPad4 user, I'm showered with excellent, top quality content, both in terms of quality and quantity. I don't have to pretend, I have both :) got the GTab10.1 late 2011 and got iPad4 late last year, I wouldn't have come to my conclusion if I didn't have both.